The first question you should ask yourself when considering opening an online store is, “How do I launch an e-commerce business? How do I start?”. There are different steps to follow, but the first is definitely to make a meticulous business plan. 1. PRODUCTS. Is yours a mono-brand, multi-brand, vertical, or horizontal e-commerce business? To clarify: do you sell eyewear of all brands, or only RayBan; do you sell only jeans or luxury accessories like bags, scarves, and hats? 2. TARGET Who is buying from you? What is your customer like? Cheap as in “99 cents and up” or fancy like Milan Fashion Week? Imagine your customers as characters in a book and give them faces and “personas”. 3. EARNINGS: what are your prices, costs, and revenues? How much will your initial investment be and when do you expect to recoup these expenses? What profit margin do you expect from your sales, distributed over several years? 4. COMPETITORS. Who else is selling what you're selling? Look for the products you sell on Google, enter the names of your competitors and map them out. 5. POSITIONING. How do you set yourself apart? In a sea of fish, what makes you a catch? Avoid conforming too much, or you won't have a competitive advantage; at the same time, don't be too eccentric, or you’ll lose your positioning. Software or marketplace, CMS or proprietary e-commerce? The first step is to find out what the market offers. Cloud solutions “hosted” on the servers of the host platform, for a subscription fee. Shopify and Storeden are two of the best-known examples. PRO: they are very easy to use. CON: they offer few possibilities for customization. A good alternative to this kind of solution is to use a software builder + host space with your proprietary domain. They are like huge, multi-brand e-commerce stores, and include generalists like Amazon or specialists likeonline distribution platforms, or serve particularly niche markets likeEtsy, the e-commerce site for home-made crafts. PRO: easy to use, pay-as-you-go, high traffic volumes. CONS: you get little recognition (customers remember Amazon rather than its individual merchants). Web applications with source code that is open and accessible to all (hence the name “open source”), like WooCommerce, PrestaShop, and Magento. PRO: they have low start-up costs and a large reference community. CONS: they are not so easy to manage and they often require you to install different plugins, which slow down loading times. Web applications with proprietary source code. PRO: useful if you have particular customizations in mind and you don’t want a carbon copy of other sites. CONS: they require programming skills and are often very expensive. How much hosting space will you need? Are costsincluded in the cost of the platform or not? How large and complex is the catalog? What kind of graphic template do you want to use? Your e-commerce business is an individual site with many products or services to sell. What is the best strategy for promoting it? Try these 3 kinds of strategies and put them into practice right away: retargeting, Google Shopping, and Email Marketing. A user visits your site. Before taking any action, the user leaves. 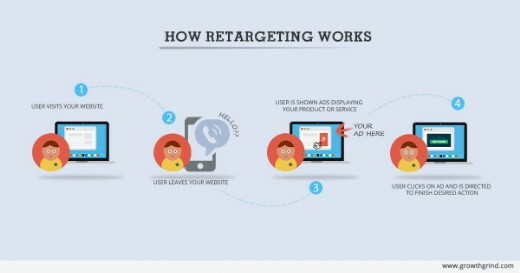 You follow up by “retargeting” that user with a targeted advertisement. If the law of attraction works, the user will click on the advertisement, return to your site, and complete the purchase. Google Shopping is the first kind of CPC (cost per click) solution, and should definitely be considered by e-commerce vendors. Like AdWords, it uses ”keyword advertising”, a kind of auction for keywords in which you pay for your advertisement to show up when the user types in specific words. To become a guru, follow the advice on Bigcommerce.com and don’t forget to post announcements directly on the product sheets! E-mail marketing is dead, long live e-mail marketing. Despite highs and lows, e-mail marketing campaigns remain a crucial step in promoting an e-commerce business. The challenge? Activating an e-mail strategy and being able to maintain it over time. PRO advice for DEM? Gather the contacts you already havein-house, organize them into lists and differentiate your messages based on these lists: this is an extremely condensed summary of the winning strategy many web agencies suggest online. The user has the option of choosing which of the 3 levels of privacy to consent to checking off the options on the flag in every location where consent is requested: note that the options on the flag cannot be pre-selected. A summary of the order information to proceed to the sale, with an explicit request for consent. Business plan? Done. Analysis of competitors and positioning? Done. Choosing a platform? Done. E-commerce check-up? Done. Complying with regulations? Done. You’re ready to launch a successful e-commerce business. Do you feel the thrill? That’s a good sign!